Colder weather, holidays on the way…this time of year gets me in the baking mood! 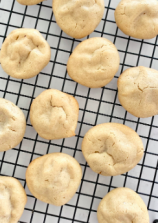 Tahini Maple Cookies = no white flour, no white sugar. Just 3 real-food ingredients: egg + maple syrup + tahini*. PS: They are naturally gluten-free. *Tahini is basically like peanut butter but made from sesame seeds…it’s found near the other nut butters or sometimes in the international aisle. Read more about tahini benefits here. In a bowl, mix together 1 egg + 2 tablespoons pure maple syrup. Stir in 1/2 cup tahini (room temp). On a cookie sheet, scoop 12 tablespoon-size mounds of the batter. Smooth each one with your finger or a spoon. Bake at 350 for 10 minutes. Let cool. They taste best right out of the oven, when the edges are crisp and the middle is soft! Leftovers can be kept loosely wrapped at room temperature for up to 3 days. Wrapped too tight they get soft, not wrapped they get hard. Consider only baking what you want to eat…then scooping the rest into individual cookie mounds & freezing. That way you can take out just a few frozen mounds, bake them, and get fresh hot cookies anytime…this is also easy portion control!